Mustad Signature Big Game C70SD: #4, opens slightly at 15-pounds, returns to normal. Gamakatsu C14S: #2 (similar hook gap to #4 34007 & C70SD, but much heavier wire), opens slightly at 15-pounds, stays open. Mustad 34007 (baseline/control): #4, opens significantly at 12-pounds, stays open. Mustad C47SD (Shrimp): #6 (similar shank-length to Gama C14S, much lighter wire), opens significantly at 12-pounds, stays open. Targus (Saltwater O’shaughnessy-style): #6, opens easily at 9-pounds, stays open. The results: even the strongest hook will still open under 15 pounds of pressure (though the strongest will return to normal hook-shape when the pressure lessens), and the hooks I was using—the Mustad 34007s in the picture above—opened significantly under 12 pounds. This is surprising for several reasons. First, this is/was one of the most common bonefish hooks, popular because it is stainless. Anglers that might spend 1-2 weeks a year chasing bones don’t want to invest in flies that will be a rusty mess by their next trip. Second, this hook was what 90% of the store-bought bonefish flies were tied on. But, for fly tiers somewhere in Montana or Wyoming, I suspect these hooks looked plenty strong, especially compared to a #27 bronze, dry-fly hook. That sounds bad, but let’s get some perspective on this. Most #8 reels are unable to hold more than 5 pounds of pressure (as seen here ). That’s right, 5 pounds of drag is an average score for an 8-weight saltwater reel. That’s barely half the weight of your average house cat, so what gives? Remember, the hook is the only part of your tackle that actually touches the fish. Let’s do the numbers. Tippet = 12 pounds. Hook = 9-12 pounds (before failure, on average). Reel = 5-6 pounds. Yet, bonefish anglers still regularly break fish off or open hooks. How? If you’re drag can’t even max out at half the force it takes to open a hook (or break the tippet), then how? Simple answer: adrenaline. Yup; it’s the moment when you actually hook a fish that you’re the most likely to break it off or open the hook. And, if you hold on too long during that first explosion of speed, you might not break the fish off immediately, but you might have opened the hook enough for the fish to slip off later in the fight. So, the weakest link is either the hook or the tippet, and you can always use heavier tippet. That’s what makes hook selection so critical: we saltwater fly fishers really need the best hooks to hold up to the challenge of the species we chase. We need hooks that are thin (light), strong, stiff (yet flexible), and durable. If hook manufacturers get the formula wrong you end up with strong, brittle hooks (that break, like Tiempco tempered hooks), or durable but weak (like the 34007s). So, choose wisely and don’t skimp. Remember the hook is the only part of your tackle that actually touches the fish! Just how strong are bonefish? and a bit of luck doesn’t hurt either. Billy Pate landed a world record tarpon of 188 pounds on 16-pound tippet in 1982. And, in 2008 a world record bonefish of 15 pounds, 4 ounces was also caught on 16 pound tippet. Let that sink in. You can catch a 15-pound bonefish on 16 pound tippet, which makes sense: that’s still lighter than the tippet size. But you can also catch a tarpon that’s over 12-times the weight of that bonefish on similar tippet. So, either bonefish are crazy-stupid-strong or tarpon are weak… and let me tell you from personal experience tarpon are not weak. So, be warned: you cannot stop a bonefish. * Even a relatively small bonefish, a “schoolie bone” in the 2-3 pound class, can generate at least 12 pounds of pressure and open the cheap-@$$ hook you tied (or bought) that fly on. 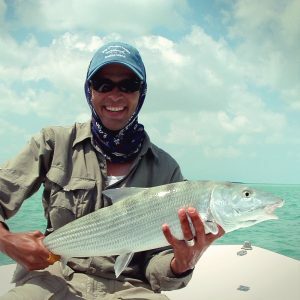 And, light tippets (like those sold in pre-packaged 8-pound-test Bonefish Leaders) will only lead to near-dead fish if you are lucky enough to even land one. 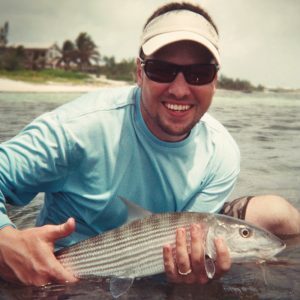 Use nothing less than 12-pound tippet for bonefish of 3-5 pounds and 16-20 pound test for anything larger, especially if there’s a chance of trophy bones over 10 pounds. Ok, this can take a little practice and doesn’t fall under the topic of hook selection, but it’s important. (Probably important enough for a whole article dedicated to knots and knot testing, but let’s just do a brief rundown here and now.) Good knots consistently test at a high percentage breaking strength. They should also be knots that you can tie well. What I mean is, you can tie a good knot poorly, and a poor knot well. Find the best knot and practice it. That’s the only way to assure consistency. You’ll be surprise at just how much pressure you’ll have to put on the right knot to break it, even in 10-pound tippet. In fact, I’ve actually broke several hooks (all stainless models) running my own knot tests (using a boga-grip, a spool of 10-pound mono, and some hooks). 1) One of the best knots for tying fly to leader is the Non-Slip Loop Knot, as tied by Lefty Kreh. It is very strong, easy to tie, and provides ample movement for the fly. 2) The strongest knot I’ve found for joining mono-to-mono is something called the Ligature Knot , but this is a pretty complicated tie (involving both hands and your teeth). A decent compromise is the more commonly known Blood Knot as tied by, well, most everybody. Feel free to Google® it. But, if you can master the Ligature Knot, your line will break somewhere else before that knot gives way. 3) Cheap hooks cost fish. It’s particularly disheartening when the hook is both cheap and stainless. That pretty much means that if you do tie strong knots and fight the fish too hard, you’ll straighten the hook and lose the fish—sad for you. But, if you tie poor knots the fish might break off with a stainless hook stuck in its mouth—sad for fishy. And, it should go without saying that stainless hooks don’t rust as quickly as tempered or galvanized models. 4) Barbless hooks penetrate deeper, and a hook that is sunk to the bend is less likely to open up than one that’s only caught on the tip and because it can’t push past the big barb. can actually straighten many #4 saltwater hooks. Let’s get back to how anglers typically lose bonefish to tackle-failure. Most anglers aren’t in much danger of breaking off their fish while fighting it. They just don’t pull hard enough on a fish for that. The real danger lies at both the beginning and end of the encounter. The hook-set is probably the most notorious time to pop a fish off. Since saltwater anglers strike the fish with their stripping hand instead of the rod (see Strip-Strike vs. Trout Set) there is no springy rod to cushion the strike. (By the way, this seems to me one of the benefits of the Trout Set when using the light tippets required on many trout streams.) 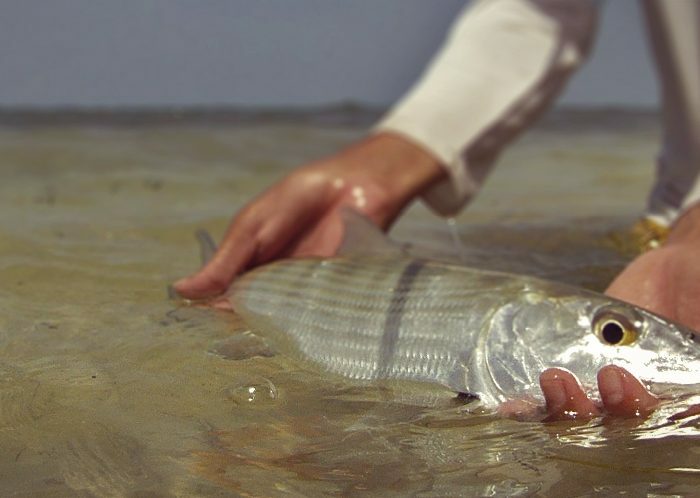 With bonefish (and tarpon, and permit, and what all) you have to develop a feel for the right amount of pressure—hitting hard enough to firmly hook the fish but not so hard you pop it off—and you’ve got an olympic second to release pressure and let the fish run. This can take some practice. I guess one of the things that bugs me about not fighting fish hard enough is that we easily could. Have you ever cranked down the drag on your reel and tested how many pounds it takes to pull line off? I mean, 15 pounds is actually a lot of pressure. Even though most reels can’t even hold 6 pounds of drag, when you try this you inevitably feel as if the rod is going to explode from the sheer pressure. I remember a 10-weight reel I used for this test that cranked all the way down only put about 6 pounds of pressure with 20 feet of line out the rod tip before the drag slipped. Still, I kept wishing I had safety glasses on since I was sure my rod was going simply explode, blinding me with shrapnel. Needless to say, it didn’t. What I did learn was that even when I thought I was really pulling on a fish it was nothing compared to that measly 6 pounds of pull. I now shudder to think how little pressure I was putting on all the fish I’d fought before that simple test. Finding the right pressure when landing a fish can also be a ticklish moment. This is true of any fish but especially for bonefish, who always seem capable of at least one more surprising burst just when you think they’re licked. These runs toward the end of the fight may not have the same zing as that first blast across the flat, but they are just as hard on tackle. I think this is because the fish is closer to you than at any previous point in the fight. That means you don’t have the stretch of the fly line and leader granting you room for error. Do you know just how much stretch is in the average fly line. Trust me, it’s lots. This is the time to keep nice loose elbows and be ready to give line quickly if the fish makes a last ditch run. If you’ve done your job so far, it won’t run far. Long and short: tie good knots, don’t skimp on hooks, and stay sharp when you’ve got that fish in close.